2001. Composed by Charles Wuorinen (1938-). String Quartets. Score and parts. Composed 2001. Duration 00:08:30. Edition Peters #EP68012. Published by Edition Peters (PE.EP68012). 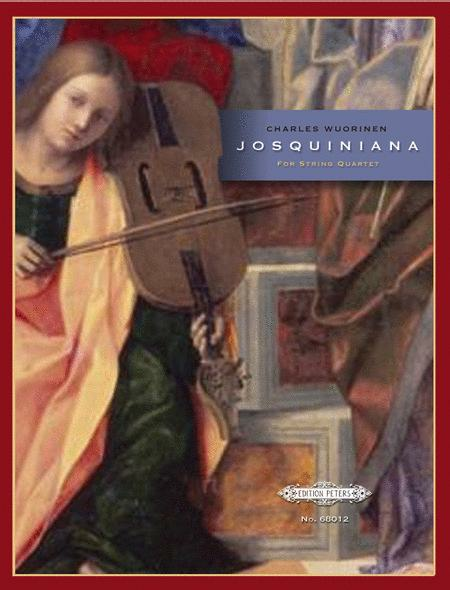 Six secular works of Josquin des Prez in 3, 4, and 5 voices, remade for string quartet; composed for the Brentano String Quartet. Includes: Helas madame; Faulte d'argent; Cela sans plus; Comment peult; Vive le Roy; El Grillo ('Josquin d'Ascanio'). Done not inWuorinen's characteristic style but in a much more straight-forward, accessible manner. Published in celebration of Wuorinen's 70th birthday.